Our PRO MAX3800 is a commercial quality pressure washer with belt drive to provide up to 3 TIMES the pump life of direct drive models. The 50' steel-reinforced hose, triplex pump, and big pneumatic tires are all designed for extended use. Big Cleaning Power and 2 Free Cleaning Tools! Free Turbo Nozzle and Soap Blaster! Push Button Start and FREE Power Broom! Professional Power and Triplex Pump! Commercial Grade with Belt Drive! The DR PRO MAX3800 features a heavy-duty belt drive to promote extra long pump life, making it a great choice for the professional or anyone who will use it frequently and needs maximum cleaning power. The triplex pump is rebuildable, so this is a machine you can count on for years of reliable service. The compact, lightweight design makes for easy mobility around the jobsite. Extra-long, steel-reinforced hose with quick-change connections make using this hose easy to use and extremely durable. Lasts up to 3X longer than direct drive triplex pumps. Brass head fittings and ceramic-coated stainless steel plunger. Beefy pneumatic tires (10" x 4") are designed to ride over all types of uneven terrain so you can take the unit anywhere. I haven't had this product very long, but I like it so far. 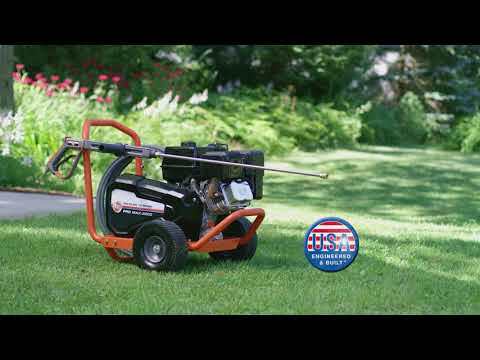 This is my second Generac pressure washer. The first one, I had for about 8 or 9 years, but was recently stolen. It was a shaft driven pump putting g out 3100 psi with a Honda engine. I liked it so much that I wanted to replace it with another Generac. My new one has a belt driven pump putting out 3800psi with what I think is a Generac brand engine. I have a lot of faith in Honda small engines and was curious as to why Generac is no longer using them. I hope I get the same reliability with my new pressure washer. Time will tell. This pressure washer is one I can count on. It has a lot of cleaning power and the belt driven pump is likely to last for years! Q.Are there any limitations on the length of garden hose used? A.Thank you for your questions. Yes, the maximum length of supply garden hose is 50'. Using a longer hose can lower the amount of water available to the pump due to how far the water will need to travel from the source. There can be periods of time where the pump will be running dry, causing damage to the pump that is not covered by the warranty. Please feel free to contact us if you have any other questions. Q.How do I select the correct Power Washer for my needs? A.The first question you should ask yourself is where you intend to use the Power Washer- at home or at work. A Power Washer used primarily at home probably doesn't need to be as powerful as one needed for a job site. Around the house, for example, you shouldn't need more than 3200 PSI. To be fully productive on a job site, you would probably need at least 3200 PSI. Next, ask what you want to clean. If you are looking to simply take the dirt and grime off of the driveway or the patio furniture, you can use a unit with a relatively low pressure. However, if you plan on scrubbing mold and mildew off of concrete or prepping a house for painting, you should consider a unit with a higher pressure. Finally, think about how much cleaning you will be doing. If you are cleaning a number of items or if you need to clean a large area, you would want to consider a unit with a higher GPM. More water means more cleaning power. A higher GPM will make the job go faster. Please feel free to contact us if you have any other questions. Q.What do PSI Max and GPM Max mean? A.Thank you for contacting us. A Max/Min rating means that the max PSI is set using one nozzle and the max GPM is set using another. The nozzles used are noted on the top of the box. This is the standard PWMA rating method. Please feel free to contact us if you have any other questions. A.Thank you for your interest. PSI measures how much force the Power Washer is spraying. GPM measures the amount of flow the Power Washer deliver behind that PSI force. Think of PSI as what can I clean and GOM as how fast can I clean it. Please feel free to contact us again if you have any other questions.